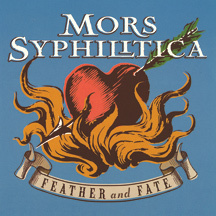 Gushing with romance, Mors Syphilitica’s third collection of songs remains loyal to the passion of their mid-80s Goth Rock roots (Lisa and Eric led the band Requiem in White), while blossoming forth with a spirit of reverie and lighthearted joy that infuses the album with a glowing light. Fear not! The happiness is like an image of a Pre-Raphaelite woman smelling a rose: music tumbles forth in a lush guitar symphony, with heavenly layers of vocals skipping carefree over whatever darkness lies beneath. Eric’s passionate devotion to Mors Syphilitica shines through; in fact, he is so obsessed with its purity that he works in isolation, playing every instrument on FEATHER and FATE himself. “In the recording process,” Eric comments, “the more I can whittle it down to where it’s just a musical romance between my wife and I, the happier I am.” Together, they take you on a heartfelt journey through a lush, dreamlike and enigmatic musical vision guided by stunningly beautiful vocals . . . and they embrace, desperately – as silent movie stars – in a golden, flickering light . . .